Receptor of the TNF family: TRAIN-receptor. The present invention relates to novel receptors in the TNF family. A novel receptor has been identified, referred to herein as TRAIN. The TNF family consists of pairs of ligands and their specific receptors referred to as TNF family ligands and TNF family receptors (Bazzoni and Beutler, 1996). The family is involved in the regulation of the immune system and possibly other non-immunological systems. The regulation is often at a "master switch" level such that TNF family signaling can result in a large number of subsequent events best typified by TNF. TNF can initiate the general protective inflammatory response of an organism to foreign invasion that involves the altered display of adhesion molecules involved in cell trafficking, chemokine production to drive specific cells into specific compartments and the priming of various effector cells. As such, the regulation of these pathways has clinical potential. The TNF receptor family is a collection of related proteins that generally consist of an extracellular domain, a transmembrane domain and an intracellular signaling domain. The extracellular domain is built from 2-6 copies of a tightly disulphide bonded domain and is recognized on the basis of the unique arrangement of cysteine residues. Each receptor binds to a corresponding ligand although one ligand may share several receptors. In some cases, it is clear that by alternate RNA splicing, soluble forms of the receptors lacking the transmembrane region and intracellular domain exist naturally. Moreover, in nature, truncated versions of these receptors exist and the soluble inhibitory form may have direct biological regulatory roles. Clearly, viruses have used this tactic to inhibit TNF activity in their host organisms (Smith, 1994). These receptors can signal a number of events including cell differentiation, cell death or cell survival signals. Cell death signaling often is triggered via relatively direct links to the caspase cascade of proteases e.g. Fas and TNF receptors. Most receptors in this class can also activate NFKB controlled events. An emerging theme in the TNF family of receptors has been the use by nature of both full length receptors with intracellular domains that transmit a signal and alternate forms which are either secreted or lack an intracellular signaling domain. These later forms can inhibit ligand signaling and hence can dampen a biological response. There are several examples of this phenomenon. First, the TNF receptor p75 is readily secreted following selective cleavage from the membrane and then acts to block the action of TNF. It is likely that nature has evolved this system to buffer TNF activity. A second example is provided by the TRIAL-TRAIL receptor system where there are 4 separate genes encoding TRAIL receptors (1-3). Two of these TRAIL-R1 and TRAIL-R2 possess intracellular domains and transduce signal. A third receptor (TRAIL-R4) has an intracellular domain yet this domain does not have all the elements found in R1 and R2, e.g. it lacks a domain capable of signaling cell death. Lastly, there is a fourth receptor TRAIL-R3, that is essentially a soluble form but remains tethered by a glycolipid linkage. Hence this receptor can bind ligand yet it is unable to transmit a signal, i.e. it is effectively a decoy receptor. A third example is provided by the osteoprotegerin (OPG) system where the OPG receptor lacks a transmembrane domain and is secreted into the medium (4-6). This receptor can block the signaling necessary to induce osteoclast differentiation possibly by binding to a ligand called RANK-L. The TRAIN system described here resembles the OPG paradigm in that a short version can be secreted that would inhibit the natural TRAIN-L (currently unknown) from binding to full length TRAIN and eliciting a signal. The receptors are powerful tools to elucidate biological pathways via their easy conversion to immunoglobulin fusion proteins. These dimeric soluble receptor forms are good inhibitors of events mediated by either secreted or surface bound ligands. By binding to these ligands they prevent the ligand from interacting with cell associated receptors that can signal. Not only are these receptor-Ig fusion proteins useful in an experimental sense, but they have been successfully used clinically in the case of TNF-R-Ig to treat inflammatory bowel disease, rheumatoid arthritis and the acute clinical syndrome accompanying OKT3 administration (Eason et al., 1996; Feldmann et al., 1996; van Dullemen et al., 1995). One can envision that manipulation of the many events mediated by signaling through the TNF family of receptors will have wide application in the treatment of immune based diseases and also the wide range of human diseases that have pathological sequelae due to immune system involvement. A soluble form of a recently described receptor, osteoprotegerin, can block the loss of bone mass and, therefore, the events controlled by TNF family receptor signaling are not necessarily limited to immune system regulation. Antibodies to the receptor can block ligand binding and hence can also have clinical application. Such antibodies are often very long-lived and may have advantages over soluble receptor-Ig fusion proteins which have shorter blood half-lives. The receptors are also useful to discover the corresponding ligand as they can serve as probes of the ligand in expression cloning techniques (Smith et al., 1993). Likewise, the receptors and ligands can form in vitro binding assays that will allow the identification of inhibitory substances. Such substances can form the basis of novel inhibitors of the pathways. Figure 1 shows the nucleotide sequences for human TRAIN receptor from a composite of two lambda gt10 clones (GJ159 and GJ 158). Figure 2 shows a comparison of human TRAIN receptor (top) and murine TRAIN receptor long (bottom). Figure 3 shows the nucleotide sequences for human TRAIN receptor from a subclone of lambda gt10 cDNA. Figure 4 shows the amino acid sequence for human TRAIN corresponding to the nucleotide sequence in Figure 1. Figure 5 shows the amino acid sequence for human TRAIN corresponding to the nucleotide sequence in Figure 3. "Homologous", as used herein, refers to the sequence similarity between sequences of molecules being compared. When a position in both of the two compared sequences is occupied by the same base or amino acid monomer subunit, e.g., if a position in each of two DNA molecules is occupied by adenine, then the molecules are homologous at that position. The percent of homology between two sequences is a function of the number of matching or homologous positions shared by the two sequences divided by the number of positions compared x 100. For example, if 6 of 10 of the positions in two sequences are matched or homologous then the two sequences are 60% homologous. By way of example, the DNA sequences ATTGCC and TATGGC share 50% homology. Generally, a comparison is made when two sequences are aligned to give maximum homology. A "purified prepared" or a "substantially pure preparation" of a polypeptide, as used herein, means a polypeptide that has been separated from other proteins, lipids, and nucleic acids with which it naturally occurs- Preferably, the polypeptide is also separated from other substances, e.g., antibodies, matrices, etc., which are used to purify it. "Transformed host" as used herein is meant to encompass any host with stably integrated sequence, i.e. TRAIN sequence, introduced into its genome or a host possessing sequence, i.e. receptor encoding episomal elements. A "treatment", as used herein, includes any therapeutic treatment, e.g., the administration of a therapeutic agent or substance, e.g., a drug. A "substantially pure nucleic acid", e.g., a substantially pure DNA, is a nucleic acid which is one or both of: (1) not immediately contiguous with either one or both of the sequences, e.g., coding sequences, with which it is immediately contiguous (i.e., one at the 5' end and one at the 3' end) in the naturally-occurring genome of the organism from which the nucleic acid is derived; or (2) which is substantially free of a nucleic acid sequence with which it occurs in the organism from which the nucleic acid is derived. The term includes, for example, a recombinant DNA which is incorporated into a vector, e.g., into an autonomously replicating plasmid or virus, or into the genomic DNA of a prokaryote or eukaryote, or which exists as a separate molecule (e.g., a cDNA or a genomic DNA fragment produced by PCR or restriction endonuclease treatment) independent of other DNA sequences. Substantially pure DNA also includes a recombinant DNA which is part of a hybrid gene encoding TRAIN. "Biologically active" as used herein, means having an in vivo or in vitro activity which may be performed directly or indirectly. Biologically active fragments of TRAIN may have, for example, 70% amino acid homology with the active site of the receptor, more preferably at least 80%, and most preferably, at least 90% homology. Identity or homology with respect to the receptor is defined herein as the percentage of amino acid residues in the candidate sequence which are identical to the TRAIN residues in SEQ. ID. NO. 3. The claimed invention relates to a novel receptor designated TRAIN-R. The amino acid sequence of murine TRAIN-R is set forth in SEQ. ID. NO.1 (the short form) and SEQ. ID. NO. 2, (the long form). The full length amino acid sequence of human TRAIN-R is set forth in SEQ. ID. NO. 3 and Figure 1. As shown in Figure 1, the protein length is 417 amino acids. The predicted signal sequence runs from residues 1-25. It is believed that the mature N-terminus is at amino acid residue 26, the extracellular domain spans residues 26 - 173, the transmembrane domain spans residues 174 - 190, and the cytoplasmic domain spans residues 191 - 417. There is a potential N-linked glycosylation site at residue 105. SEQ- ID. NO. 4 sets forth the amino acid sequence for the carboxy terminal 30 amino acids of a secreted form of human TRAIN-R from a subclone of lambda gt10 cDNA (GJ156). This peptide sequence features 30 amino acids that are identical to amino acids 121 - 149 of the composite protein shown in Figure 1 and are identical to amino acids 121-150 of the C-terminus of murine TRAIN-R short form (secreted protein). SEQ. ID. NO 9 shows the amino acid sequence of the entire short secreted form of the human TRAIN-R based on the alternate cloned exon and by comparison to the mouse short form. Figure 2 shows a comparison of the first 214 amino acids of human TRAIN-R (417 a.a) and murine TRAIN-R long (214 a.a.). As shown in the Figure, the two sequences have an identity of about 81.8%. The TRAIN receptors of the invention may be isolated from mammalian tissues and purified to homogeneity, or isolated from cells which contain membrane-bound TRAIN-R, and purified to homogeneity. Methods for growing cells and isolating cell extracts are well known in the art, as are various cell types and growth and isolation methods. In general, any TRAIN-R can be isolated from any cell or tissue expressing this protein using a cDNA probe, isolating mRNA and transcribing the mRNA into cDNA. Thereafter, the protein can be produced by inserting the cDNA into an expression vector, such as a virus, plasmid, cosmid or other expression vector, inserting the expression vector into a cell, and proliferating the resulting cells. The TRAIN-R can then be isolated from the medium or cell extract by methods well known in the art. One skilled in the art can readily vary the vectors and cell lines and still obtain the claimed receptors. Alternatively, TRAIN receptors can be chemically synthesized using the sequences set forth in SEQ- ID. NOs. 1, 2, 3 or 4. It is believed that murine TRAIN-R is expressed highest in brain and lung and at a lower level in liver, skeletal muscle and kidney. The expression pattern of human TRAIN-R differs in that a low level of expression has been detected in every tissue and cell line tested thus far (ubiquitous) with a significantly higher expression detected in heart, prostate, ovary, testis, peripheral blood lymphocytes (PBLs), thyroid, and adrenal gland. Murine TRAIN-R may exist in nature as a natural soluble form as indicated in SEQ. ID. NO. 1. Human TRAIN-R may exist as a natural soluble form having the carboxy sequence indicated in SEQ. ID. NO. 4 and Figure 3. The soluble protein should inhibit signaling by the full length TRAIN-R. The present invention also encompasses DNA sequences which encode the murine (both long and short) and human TRAIN receptors (full length and carboxy terminus). These DNA sequences are set forth in SEQ. ID. NOs. 5, 6, 7 and 8, respectively. The human TRAIN-R sequence in SEQ. ID. NO. 7 contains 5'UTR, a complete coding region, a stop codon and some 3'UTR. Figure 1 shows the nucleotide sequence for human TRAIN-R as derived from a composite sequence of GJ159 and GJ158. As shown in Figure 1, human TRAIN-R has a nucleotide sequence length of 2185, a coding region from 179 -1429, and a stop codon at 1430 -1432. The human TRAIN-R sequence in SEQ. ID. NO. 8 contains intron sequence, an exon encoding the carboxy terminal 30 amino acids of a secreted form of human TRAIN-R, a stop codon and 3'UTR. As shown in Figure 3, it is believed that the intron is at residues 1 - 350, the coding region at 352 - 441, the stop codon at 442 - 444 and the 3' UTR = 445 - 791. The invention in certain embodiments furthermore relates to DNA sequences encoding the TRAIN receptors where the sequences are operatively linked to an expression control sequence. Any suitable expression control sequences are useful in the claimed invention, and can easily be selected by one skilled in the art. The invention also contemplates recombinant DNAs comprising a sequence encoding TRAIN receptors or fragments thereof, as well as hosts with stably integrated TRAIN-R sequences introduced into their genome, or possessing episomal elements. Any suitable host may be used in the invention, and can easily be selected by one skilled in the art without undue experimentation. The claimed invention in certain embodiments encompasses recombinant TRAIN-R. One skilled in the art can readily isolate such recombinant receptors thereby providing substantially pure recombinant TRALN-R polypeptides. Isolated receptors of the invention are substantially free of other contaminating materials of natural or endogenous origin, and contain less than about 10- 15 % by mass of protein contaminants residual of production processes. Mammalian Receptors within the scope of the invention also include, but are not limited to, primate, human, murine, canine, feline, bovine, ovine, equine and porcine TRAIN-R. Mammalian Receptors can also be obtained by cross species hybridization using a single stranded cDNA derived from the human TRAIN-R. DNA sequences of the invention can be used as a hybridization probe to isolate Receptor cDNAS from other mammalian cDNA libraries. Derivatives of the Receptors within the scope of the invention also include various structural forms of the proteins of SEQ. ID. NOs. 1, 2, 3 and 4 which retain biological activity. For example, a receptor protein may be in the form of acidic or basic salts, or may be in neutral form. Individual amino acid residues may also be modified by oxidation or reduction. Receptor derivatives may also be used as immunogens, reagents in a receptor-based immunoassay, or as binding agents for affinity purification procedures of TRAIN ligands. The present invention also includes TRAIN-R with or without associated narive-pattern glycosylation. One skilled in the art will understand that the glycosylation pattern on the receptor may vary depending on the particular expression system used. For example, typically, expression in bacteria such as E. coli results in a non-glycosylated molecule. TRAIN-R derivatives may also be obtained by mutations of the receptors or their subunits. A mutant, as referred to herein, is a polypeptide homologous to a claimed Receptor but which has an amino acid sequence different from the native sequence due to a deletion, insertion or substitution. Bioequivalent analogs of the Receptor proteins of the invention may be constructed by for example, making various substitutions of residues or sequences or delating terminal or internal residues or sequences not needed for biological activity. For example, often cysteine residues can be deleted or replaced with other amino acids to prevent formation of unnecessary or incorrect intramolecular disulfide bridges upon renaturation. Other approaches to mutagenesis involved modifications, for example, to enhance expression in the chosen expression system. Soluble Receptors of the invention may comprise subunits which have been changed from a membrane bound to a soluble form. Thus, soluble peptides may be produced by truncating the polypeptide to remove, for example, the cytoplasmic tail and/or transmembrane region. Alternatively, the transmembrane domain may be inactivated by deletion, or by substitutions of the normally hydrophobic amino acid residues which comprise a transmembrane domain with hydrophilic ones. In either case, a substantially hydrophilic hydropathy profile is created which will reduce lipid affinity and improve aqueous solubility. Deletion of the transmembrane domain is preferred over substitution with hydrophilic amino acid residues because it avoids introducing potentially immunogenic epitopes. Soluble Receptors of the invention may include any number of well-known leader sequences at the N-terminus. Such a sequence would allow the peptides to be expressed and targeted to the secretion pathway in a eukaryotic system. The invention herein provides agents, such as agonists and antagonists, directed against the claimed receptors. In certain embodiments this invention, the agent comprises a blocking agent that comprises an antibody directed against the TRAIN-R that inhibits TRAIN receptor signaling. Preferably the antibody is a monoclonal antibody. Similarly, the claimed invention encompasses antibodies and other agents which act as agonists in the TRAIN pathways. Inhibitory anti-TRAR4-R antibodies and other receptor blocking agents can be identified using screening methods that detect the ability of one or more agents either to bind to the TRAIN-R, or ligands thereto, or to inhibit the effects of TRAIN-R signaling on cells. One skilled in the art will have knowledge of a number of assays that measure the strength of ligand-receptor binding and can be used to perform competition assays with putative TRAIN receptor blocking agents. The strength of the binding between a receptor and ligand can be measured using an enzyme-linked immunoadsorption assay (ELISA) or a radioimmunoassay (RIA). Specific binding may also be measured by flourescently labeling antibody-antigen complexes and performing fluorescence activated cell sorting analysis (FACS), or by performing other such immunodetection methods, all of which are techniques well-known in the art. With any of these or other techniques for measuring receptor-ligand interactions, one skilled in the art can evaluate the ability of a blocking agent, alone or in combination with other agents, to inhibit binding of ligands to the receptor molecules. Such assays may also be used to test blocking agents or derivatives of such agents, i.e. fusions, chimeras, mutants or chemically altered forms, to optimize the ability of the agent to block receptor activation. The receptor blocking agents of the invention in one embodiment comprise soluble TRAIN receptor molecules. Using the sequence information herein and recombinant DNA techniques well known in the art, functional fragments encoding the TRAIN receptor ligand binding domain can be cloned into a vector and expressed in an appropriate host to produce a soluble receptor molecule. Soluble TRAIN receptor molecules that can compete with native TRAIN receptors for ligand binding according to the assays described herein can be selected as TRAIN receptor blocking agents. A soluble TRAIN receptor comprising amino acid sequences selected form those shown herein may be attached to one or more heterologous protein domains ("fusion domains") to increase the in vivo stability of the receptor fusion protein, or to modulate its biological activity or localization. Preferably, stable plasma proteins -- which typically have a half life greater than 20 hours in the circulation of a mammal- are used to construct the receptor fusion proteins. Such plasma proteins include but are not limited to immunoglobulins, serum albumin, lipoproteins, apolipoproteins and transferrin. Sequences that can target the soluble receptors to a particular cell or tissue type may also be attached to the receptor ligand binding domain to create a specifically localized soluble receptor fusion protein. All or a functional fragment of the TRAIN receptor extracellular region comprising the TRAIN receptor ligand binding domain may be fused to an immunoglobulin constant region like the Fc domain of a human IgG1 heavy chain. Soluble receptor -IgG fusions proteins are common immunological reagents and methods for their construction are well known in the art. (see, e.g. U.S. Patent No. 5, 225, 538). A functional TRAIN-R ligand binding domain may be fused to an immunoglobulin (Ig) Fc domain derived from an immunoglobulin class or subclass other than IgG1. The Fc domains of antibodies belonging to different Ig classes or subclasses can activate diverse secondary effector functions. Activation occurs when the Fc domain is bound by a cognate Fc receptor. Secondary effector functions include the ability to activate the complement system, to cross the placenta and to bind various microbial proteins. The properties of the different classes and subclasses of immunoglobulins are described in the art. Activation of the complement system initiates cascades of enzymatic reactions that mediate inflammation. The products of the complement system have a variety of functions, including binding of bacteria, endocytosis, phagocytosis, cytotoxicity, free radical production and solubilization of immune complexes. The complement enzyme- cascade can be activated by the Fc domains of antigen-bound IgG1, IgG3 and Ig M antibodies. The Fc domain of IgG2 appears to be less effective, and the Fe domains of IgG4, IgA, IgD and IgE are ineffective at activating complement. Thus one can select an Fc domain based on whether its associated secondary effector functions are desirable for the particular immune response or disease being treated with the receptor-fusion protein. It if would be advantageous to harm or kill the TRAIN ligand bearing target cell, one could, for example, select an especially active Fe domain (IgG1) to make the fusion protein. Alternatively, if it would be desirable to target the TRAIN receptor -FC fusion to a cell without triggering the complement system, an inactive IgG4 Fc domain could be selected. Mutations in Fc domains that reduce or eliminate binding to Fc receptors and complement activation have been described in the art. These or other mutations can be used, alone or in combination to optimize the activity of the Fc domain used to construct the TRAIN receptor-Fc fusion protein. One skilled in the art will appreciate that different amino acid residues forming the junction point of the receptor-Ig fusion protein may alter the structure, stability and ultimate biological activity of the soluble TRAIN receptor fusion protein. One or more amino acids may be added to the C-terminus of the selected TRAIN receptor fragment to modify the junction point with the selected fusion domain. The N-terminus of the TRAIN receptor fusion protein may also be varied by changing the position at which the selected TRAIN receptor DNA fragment is cleaved at its 5' end for insertion into the recombinant expression vector. The stability and activity of each TRAIN receptor fusion protein may be tested and optimized using routine experimentation and the assays for selecting blocking agents described herein. Using the TRAIN receptor binding domain sequences within the extracellular domain as shown herein, amino acid sequence variants may also be constructed to modify the affinity of the soluble TRAIN receptor molecules for their ligands. The soluble molecules of this invention can compete for binding with endogenous receptors. It is envisioned that any soluble molecule comprising a TRAIN receptor ligand binding domain that can compete with native receptors for ligand binding is a receptor blocking agent that falls within the scope of the present invention. In other embodiments of this invention, antibodies directed against the TRAIL and TRAIN receptors (anti-TRAIN-R abs) function as receptor blocking agents. The antibodies of this invention can be polyclonal or monoclonal and can be modified to optimize their ability to block TRAIN-R signaling, their bioavailability, stability or other desired traits. Polyclonal antibody sera directed against TRAIN-R are prepared using conventional techniques by injecting animals such as goats, rabbits, rats, hamsters or mice subcutaneously with TRAIN-R -Fc fusion protein in Freund's adjuvant, followed by booster intraperitoneal or subcutaneous injection in incomplete Freund's. Polyclonal antisera containing the desired antibodies directed against the TRAIN receptors can then be screened by conventional immunological procedures. Various forms of anti-TRAIN-R abs can also be made using standard recombinant DNA techniques. For example, "chimeric" antibodies can be constructed in which the antigen binding domain from an animal antibody is linked to a human constant domain. Chimeric antibodies reduce the observed immunogenic responses elicited by animal antibodies when used in human clinical treatments. In addition, recombinant "humanized" antibodies which can recognize the TRAIN-R can be synthesized. Human antibodies are chimeras comprising mostly human IgG sequences into which the regions responsible for specific antigen-binding have been inserted. (e.g. WO 94/04679). Animals are immunized with the desired antigen, the corresponding antibodies are isolated, and the portion of the variable region sequences responsible for specific antigen binding are removed. The animal-derived antigen binding regions are then cloned into the appropriate position of human antibody genes in which the antigen binding regions have been deleted. Humanized antibodies minimize the use of heterologous (inter species) sequences in human antibodies, and are less likely to elicit immune responses in the mammal being treated. Construction of different classes of recombinant anti-TRAIN-R antibodies can also be accomplished by making chimeric or humanized antibodies comprising the anti-R variable domains and human constant domains isolated from different classes of immunoglobulins. For example, anti-TRAIN-R IgM antibodies with increased antigen binding site valencies can be recombinantly produced by cloning the antigen binding site into vectors carrying the human µ chain constant regions. In addition, standard recombinant DNA techniques can be used to alter the binding affinities of recombinant antibodies with their antigens by altering amino acid residues in the vicinity of the antigen binding sites. The antigen binding affinity of a humanized antibody can be increased by mutagenesis based on molecular modeling. It may be desirable to increase or decrease the affinity of anti-TRAIN-R antibodies for the receptors depending on the targeted tissue type or the particular treatment schedule envisioned. For example, it may be advantageous to treat a patient with constant levels of anti-Receptor antibodies with reduced ability to signal through the pathway for semi-prophylactic treatments. Likewise, inhibitory anti-TRAIN-R antibodies with increased affinity for the receptors may be advantageous for short term treatments. The claimed invention in yet other embodiments encompasses pharmaceutical compositions comprising an effective amount of a TRAIN-R blocking or activating agent, and pharmaceutically acceptable carriers. The compositions of the invention will be administered at an effective dose to treat the particular clinical condition addressed. Determination of a preferred pharmaceutical formulation and a therapeutically efficient dose regimen for a given application is well within the skill of the art taking into consideration for example, the condition and weight of the patient, the extent of desired treatment and the tolerance of the patient for the treatment. Doses of about 1 mg/kg of a soluble TRAIN-R are expected to be suitable starting points for optimizing treatment dosages. Determination of a therapeutically effective dose can also be assessed by performing in vitro experiments that measure the concentration of the blocking or activating agent. The binding assays described herein are useful, as are other assays known in the art. Administration of the soluble activating or blocking agents of the invention, alone or in combination, including isolated and purified forms, their salts, or pharmaceutically acceptable derivative thereof may be accomplished using any of the conventionally accepted modes of administration of agents which exhibit immunosuppressive activity. To form a receptor inhibitor for use in man, one requires the human receptor cDNA sequence of the extracellular domain. If the mouse form is known, human cDNA libraries can be easily screened using the mouse cDNA sequence and such manipulations are routinely carried out in this area. With a human cDNA sequence, one can design oligonucleotide primers to PCR amplify the extracellular domain of the receptor in the absence of the transmembrane and intracellular domains. Typically, one includes most of the amino acids between the last disulfide linked "TNF domain" and the transmembrane domain. One could vary the amount of "stalk" region included to optimize the potency of the resultant soluble receptor. This amplified piece would be engineered to include suitable restriction sites to allow cloning into various C-terminal Ig fusion chimera vectors. Alternatively, one could insert a stop signal at the 3' end and make a soluble form of the receptor without resorting to the use of a Ig fusion chimera approach. The resultant vectors can be expressed in most systems used in biotechnology including yeast, insect cells, bacteria and mammalian cells and examples exist for all types of expression. Various human Fc domains can be attached to optimize or eliminate FcR and complement interactions as desired. Alternatively, mutated forms of these Fc domains can be used to selectively remove FcR or complement interactions or the attachment of N-linked sugars to the Fc domain which has certain advantages. The above described soluble receptor forms can be used to immunize mice and to make monoclonal antibodies by conventional methods. The resultant mAbs that were identified by ELISA methods can be further screened for agonist activity either as soluble antibodies or immobilized on plastic in various in vitro cellular assays. Often the death of the HT29 cell line is a convenient system that is sensitive to signalling through many TNF receptors. If this line does not possess the receptor of interest, that full length receptor can be stably transfected into the HT29 line to now allow the cytotoxicity assay to work. Alternatively, such cells can be used in the Cytosensor apparatus to assess whether activation of the receptor can elicit a pH change that is indicative of a signalling event. TNF family receptors signal well in such a format and this method does not require one to know the actual biological events triggered by the receptor. The agonistic mAbs would be "humanized" for clinical use. This procedure can also be used to define antagonistic mAbs. Such mAbs would be defined by the lack of agonist activity and the ability to inhibit receptor-ligand interactions as monitored by ELESA, classical binding or BIAcore techniques. Lastly, the induction of chemokine secretion by various cells in response to an agonist antibody can form a screening assay. Using the receptor-Ig fusion protein, one can screen either combinatorial libraries for molecules that can bind the receptor directly. These molecules can then be tested in an ELISA formatted assay using the receptor-Ig fusion protein and a soluble form of the ligand for the ability to inhibit the receptor-ligand interaction This ELISA can be used directly to screen various natural product libraries etc. for inhibitory compounds. The receptor can be transfected into a cell line such as the HT29 line to form a biological assay (in this case cytotoxicity) that can then form the screening assay. Human TRAIN-R was cloned from two cDNA sequences. The first sequence (hTrainR) SEQ ID NO. 7 is a composite of two overlapping lambda gt10 clones (GJ159 and GJ158) from a Clontech Humann adult lung cDNA library. The composite sequence in SEQ. ID. NO. 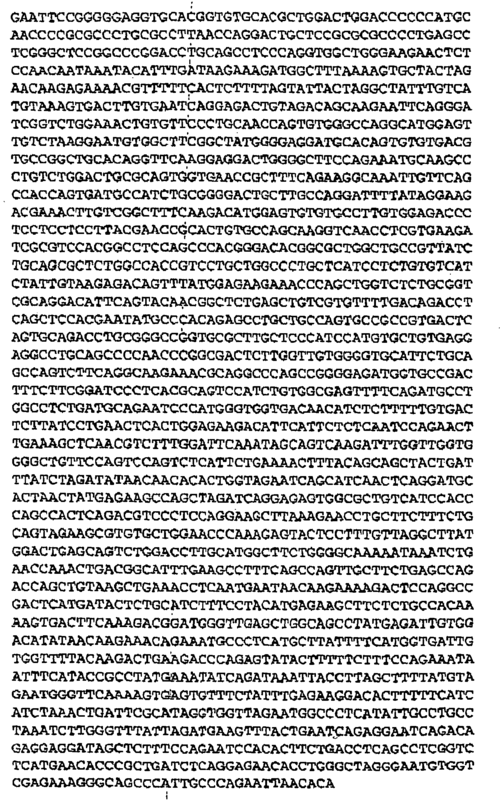 7 is 2185 nucleotides in length and encodes a 417 amino acid protein (SEQ. ID. NO.3) which has a signal sequence, a 140 amino acid extracellular domain, a transmembrane domain and a 227 amino acid intracellular domain and a stop codon. The includes another 1200 bp. The extracellular domain of human TRAIN-R encodes three TNF receptor like domains (it appears to be missing domain 1 when compared to TNF-R). The sequence in SEQ. ID. NO. 3 is 19% identical to that of low affinity nerve growth factor (LNGFR) and 24% identical to Tramp/Lard4/Wsl/Dr3, both of which are members of the TNF family. Human TRAIN-R was also cloned from a second sequence subclone of a lambda gt10 cDNA (GJ 156, a 790bp subclone). The resulting sequence is shown in SEQ. ID. NO. 8. It contains intron sequence, an exon encoding the Carboxy-terminal 30,amino acids of a secreted form of human TrainR, a stop codon and a 3'UTR. The 30 amino acids in the exon sequence were 100% homologous to the murine C-term secreted form (short form of murine Train Receptor). Two predominant messages are observed 5 kb and 0.5 kb. Aggarwal, B. B., and Natarajan, K. (1996). Tumor necrosis factors: developments during the last decade. Eur Cytokine Netw 7,93-124. Bazzoni, F., and Beutler, B. (1996). The tumor necrosis factor ligand and receptor families. N Engl J Med 334, 1717-25. Eason, J. D., Pascual, M., Wee, S., Farrell, M., Phelan, J., Boskovic, S., Blosch, C., Mohler, K. M., and C osimi, A. B. (1996). Evaluation of recombinant human soluble dimeric tumor necrosis factor receptor for prevention of OKT3-associated acute clinical syndrome. Transplantation 61, 224-8. Eggermont, A. M., Schraffordt Koops, H., Lienard, D., Kroon, B. B., van Geel, A. N., Hoekstra, H. J., and Lejeune, F. J. (1996). Isolated limb perfusion with high-dose tumor necrosis factor-alpha in combination with interferon-gamma and melphalan for nonresectable extremity soft tissue sarcomas: a multicenter trial [see comments]. J Clin Oncol 14, 2653-65. Feldmann, M., Brennan, F. M., and Maini, R. N. (1996). Role of cytokines in rheumatoid arthritis. Annu Rev Immunol. Green, D. R., and Ware, C. F. (1997). Fas-Ligand: Privilege and Peril. Proc. Natl. Acad. Sci. USA 94, 5986-5990. Smith, C. A., Gruss, H. J., Davis. T., Anderson, D., Farrah, T., Baker, E., Sutherland, G. R., Brannan, C. I., Copeland, N. G., Jenkins, N. A., and et, a. L (1993). CD30 antigen, a marker for Hodgkin's lymphoma, is a receptor whose ligand defines an emerging family of cytokines with homology to TNF. Cell 73, 1349-60. Smith, G. L. (1994). Virus strategies for evasion of the host response to infection. Trends in Microbiol. 82, 81-88.
van Dullemen, H. M.,:van Deventer, S. J., Hommes, D. W., Bijl, H. A., Jansen, J., Tytgat. G. N., and Woody, J. (1995). Treatment of Crohn's disease with anti-tumor necrosis factor chimeric monoclonal antibody (cA2). Gastroenterology 109, 129-35. (d) DNA sequences that at least encode a fragment of the polypeptide defined by SEQ ID NO: 3 or SEQ ID NO: 4, wherein said fragment displays a biological activity of TRAIN receptor protein. The DNA sequence of claim 1, wherein said DNA sequence encodes a polypeptide comprising the amino acid sequence that is defined by amino acids 26 to 173 of SEQ ID NO: 3 and a human immunoglobulin Fc domain. 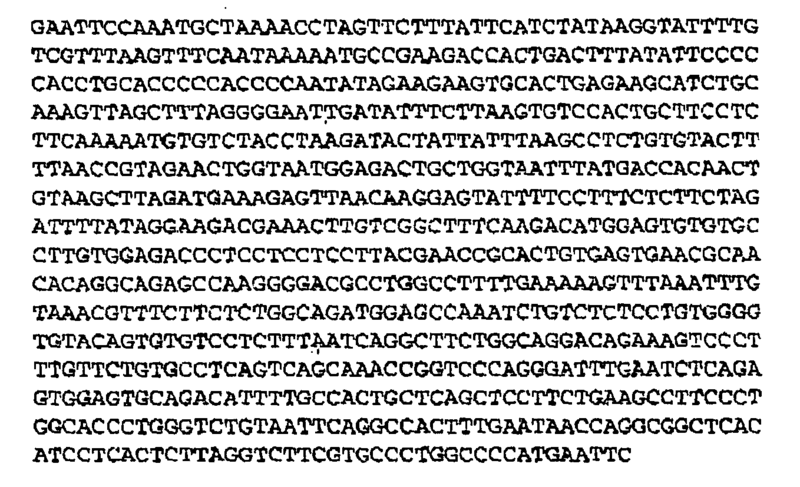 A recombinant DNA molecule comprising the DNA sequence according to claim 1 or claim 2, said DNA sequence being operatively linked to an expression control sequence. A vector containing the DNA sequence according to claim 1 or claim 2, or the recombinant DNA molecule of claim 3. A host cell genetically engineered with the DNA sequence according to claim 1 or claim 2, the recombinant DNA molecule of claim 3, or the vector of claim 4. (b) allowing the cell to live under conditions such that the polypeptide is expressed. An isolated TRAIN receptor polypeptide that is encoded by the DNA sequence according to claim 1 or claim 2. An antibody directed against the polypeptide of claim 7. The antibody of claim 8, wherein the antibody is a monoclonal antibody. A method for producing the antibody of claim 8 or claim 9 comprising the step of immunizing a non-human organism with the polypeptide of claim 7. A pharmaceutical composition comprising the polypeptide of claim 7 or the antibody of claim 8 or claim 9, said pharmaceutical composition further comprising a pharmaceutically acceptable carrier. Use of the polypeptide of claim 7, or of the antibody of claim 8 or claim 9, for the preparation of a medicament for preventing and/or reducing the severity of an immune response, for inducing cell death, or for treating or reducing the advancement, severity or effects of an immunological disease in a mammal. The use of claim 12, wherein the immunological disease is a cancer. The use of claim 12 or claim 13, wherein the mammal is a human. (c) screening to detect a ligand which binds to said detectably labeled polypeptide. (b) screening to detect a blocking agent which binds to said polypeptide. ES2307313T3 (en) * 1997-02-27 2008-11-16 Ono Pharmaceutical Co., Ltd. Novel Polypeptides DNA encoding and use these polpeptidos. ES2240981T3 (en) 2005-10-16 Cytokine designated Lerk-7. Free format text: DETAILS ASSIGNMENT: CHANGE OF OWNER(S), CHANGEMENT NOM PROPRIETAIRE, NOM + ADRESSE DU CO-TITULAIRE; FORMER OWNER NAME: APOTECH R&D S.A.